A free school is set to move into the former Hackney Central Police Station after the site was sold for £7.6 million. The Olive School, which is currently based in temporary accommodation in Stoke Newington, will move into the Grade II listed building once it has been converted. The primary school opened in September and aims to provide a “progressive, Muslim” education. No timeline has yet been fixed for its move to the police station, which closed last summer as part of cost-cutting measures. The Lower Clapton Road site was put on the market shortly after the police station closed, with promotional material emphasising its potential for residential redevelopment. Following an open bidding process, however, the site has been bought for use by the school, with the Education Funding Agency – the government body responsible for finding sites for free schools – paying for the site. Julie Bradley, Executive Head at the Olive School and Director of Primary Education for the Tauheedul Free Schools Trust, which runs the school, said she was “honoured” to have acquired the site. “It’s a historic building, treasured by the local community…We feel incredibly honoured that we’re able to take over that history,” she added. Ms Bradley said the building was blessed with large amounts of outdoor space, unlike the sites other London schools were forced to use. As well as the main four storey building, the site consists of a house on St John’s Church Road and what used to be the car park for the police station. 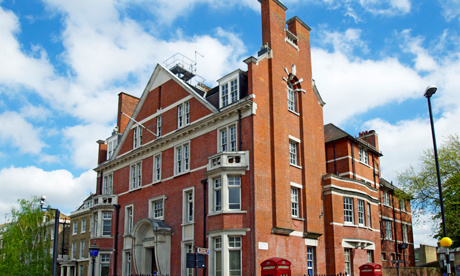 Only the main building is Grade II listed, but the site also sits within Clapton Square Conservation Area. The site was sold without planning permission, meaning the school will need approval before conversion work can be carried out. The police station closed in July last year in order to reduce costs. It was one of 63 front counters across London hit with closure and among 29 police stations put up for sale by the Mayor’s Office for Policing and Crime. The school currently has 180 children on its books across two year groups but will grow to its capacity of 630 pupils as additional forms of entry are added each year. Ms Bradley said she hoped to be able to keep the characteristic blue lamp outside the former police station. She confirmed there were no plans to retain the cells for use in school discipline.